Need more information about booking Home 9650213 ? Shanzeley is located in the Upper Langkloof area between George and Uniondale, just off the N9. 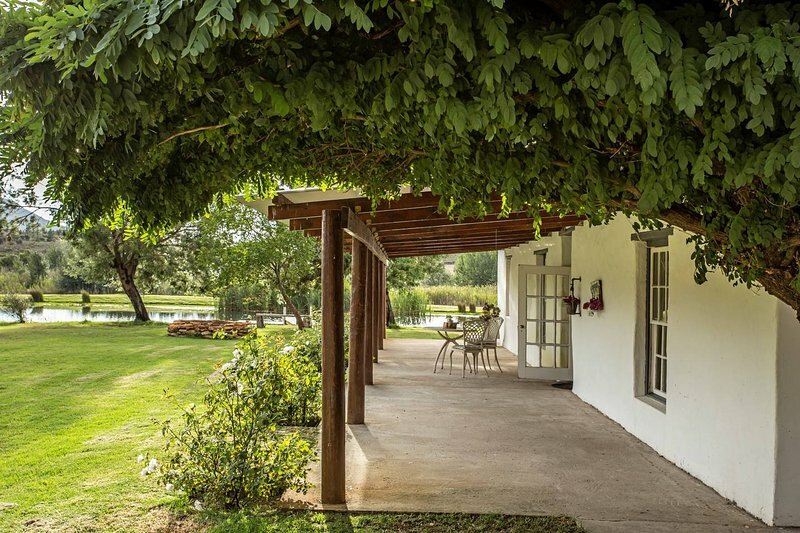 With breathtaking mountain views and tranquil scenery, this humble farmhouse, luxuriously fitted in a French Colonial style, brings deep restorative rest. Its quietness aims for a total escape from the city. Shanzeley Guest House has 3 separate units - a three-bedroom guest house, one-bedroom farm house and a one-bedroom cottage. The guest house comprises of 3 en-suite bathrooms. The main bedroom is furnished with a king-size bed that can convert into twin beds. The other 2 bedrooms are furnished each with a double bed. All bathrooms are fitted with toilets, basins and showers. The house has an open-plan living area and the kitchen contains a fridge with freezer, a microwave, a stove, an oven, crockery, and cutlery. Attached to the living area is a dining area with a 6-seater dining room table. The lounge has comfortable seating and a fireplace. The living area leads out onto a veranda overlooking the dam, perfect for that first cup of coffee and a peaceful start to the day. The farm house has one bedroom, but also sleeps 2 people in the living area on a sleeper couch. The bathroom has a bath, shower and toilet. There is also a fully kitted kitchen and dining room walking out onto a big veranda with beautiful views. The cottage only has one bedroom with an open-plan kitchen/lounge/dining room leading to a bathroom with a shower. The dining room has a built-in fireplace. There is a small veranda in front of the cottage with a view of the farm and mountain. You can get in touch with Jolette (the owner) through the contact form on this page. Send Jolette (the owner) an email through the contact form on this page. Alternatively, if there’s a phone number on this page, you can call them. How do I contact Jolette (the owner)? If you’ve already booked, go to Manage your holiday booking to view Jolette the owner's contact details or send them a message. Or send Jolette (the owner) an enquiry through the Contact the owner/manager form if you’d like a quote or more info first. When you pay online through the Book your stay form, a booking request is sent to Jolette (the owner). You’ll find out within 24 hours whether they’ve accepted - no money will leave your account before then. You can also request a quote from Jolette (the owner) through the contact form. The owner will email you the total cost for your dates and a link to book and pay online. Use the Book your stay form to pay provisionally online. You can pay by credit/debit card or PayPal. Jolette (the owner) will have 24 hours to accept the booking and no money will leave your account before then. Why can't I call Jolette (the owner) before booking? You’ll need to contact Jolette (the owner) to do this. Send them a message in Manage your holiday booking or through the contact form on this page. You can request to change the dates or number of people on your booking via the Manage your holiday booking page. To change your holiday dates use the Edit booking button. If you need to change the number of guests staying then send Jolette (the owner) a message. If Jolette (the owner) agrees, they’ll send you a revised quote outlining the changes. You can review and accept/decline this from the Manage your holiday booking page. You’ll have 48 hours to take action before the revised quote expires.